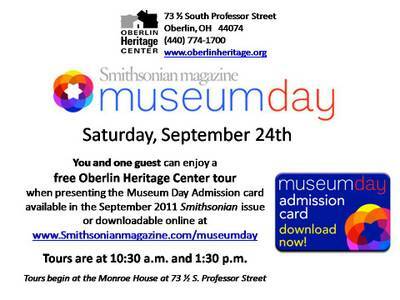 September 24 (Saturday at 10:30 a.m. and 1:30 p.m.) The Oberlin Heritage Center takes part in Smithsonian Magazine's 7th Annual Museum Day by providing free tour admission to visitors plus one guest who present the Museum Day Admission Card. A downloadable version is at www.Smithsonianmagazine.com/museumday. Museum Day involves hundreds of museums around the country and allows for one day only the free-admission policy of the Smithsonian's Washington, D.C.-based properties to be emulated throughout America. Don't miss this great opportunity to take a tour of the Oberlin Heritage Center or to visit another participating museum.